A well-run, efficient meeting generally takes a fair amount of work, particularly if it’s to be conducted at distance: there’s collating an agenda, making sure that everyone has the dial-in details and schedule, distributing the agenda and any required documentation to all of the participants, taking notes during the meting and distributing them afterwards. yaM (yet another meeting) is a collaborative online tools that aims to streamline the process and so make meetings more efficient. Agenda, minutes, action items and notes. 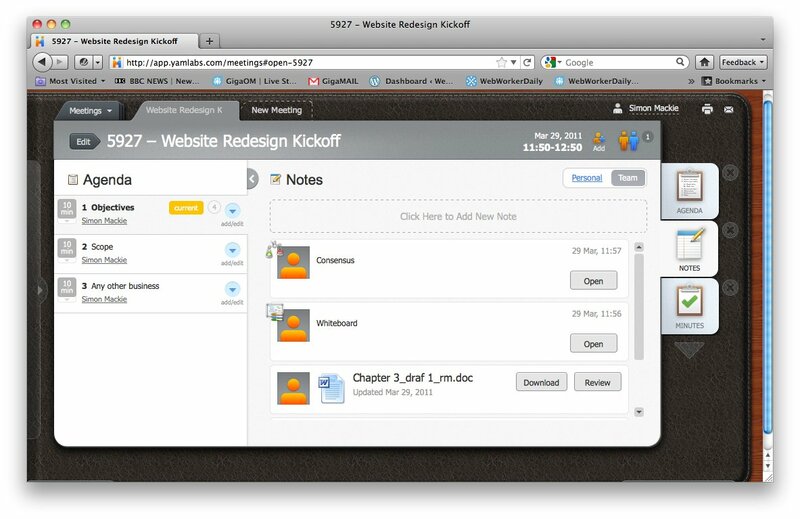 Notes and action items pages can be added to take notes during the meeting, while agenda and minutes pages can be generated automatically. Whiteboard. A collaborative virtual whiteboard to sketch out ideas. Analysis and discussion. yaM provides a range of collaborative analysis tools to help decision-making during the meting, including SWOT, cost-benefit analysis and brainstorming tools. Voting. Meeting participants can vote on ideas using the consensus development tool. Pages can be added on the fly, and all the pages from the meting are archived in the tool, keeping a handy record of meeting outcomes. yaM is free; you can sign up here.